these tiny collectibles as a child from my parents after a night out on the town. While sipping our colorful cocktails, we admired the interior of Luna Park. The brick colored walls and crystal chandeliers with rose and clear colored grapes hanging down, give the place an urban/San Francisco feel. Damon Soule artwork is strategically placed around the dining room to lend a whimsical mood. The large framed mirrors tilted at a 15 degree angle allows one to see other diners around the room. There are three intimate booths with curtains that can be drawn together for romantic dining. Looking around the room we noticed many patrons casually dressed in jeans and stripped shirts and short dresses with high heels. Luna Park offers a three-course meal for $30 or you may order a la carte. 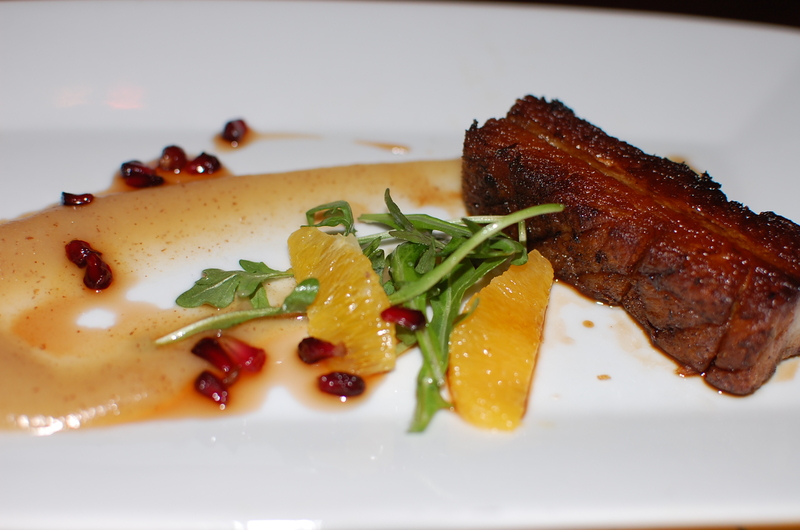 We started our dining adventure with three appetizers; a crispy pork belly with a slightly sweet quince and Riesling puree that tasted like jam. Pomegranate seeds, arugula and Satsuma orange slices provide a crunchy and sweet accompaniment with the rich meat. My favorite appetizer was the deconstructed bruchetta. The plate arrived with a generous slice of grilled garlic bread resting on top of a mound of flash fried brussels sprouts, capers and grilled onions. Next to the bread is a soft poached egg resting on a pool of celery root puree. We ripped off a bite size piece of bread, broke open the egg and scooped up the egg yolk, celery root puree and brussels sprout mixture on top of the bread. It was heavenly. 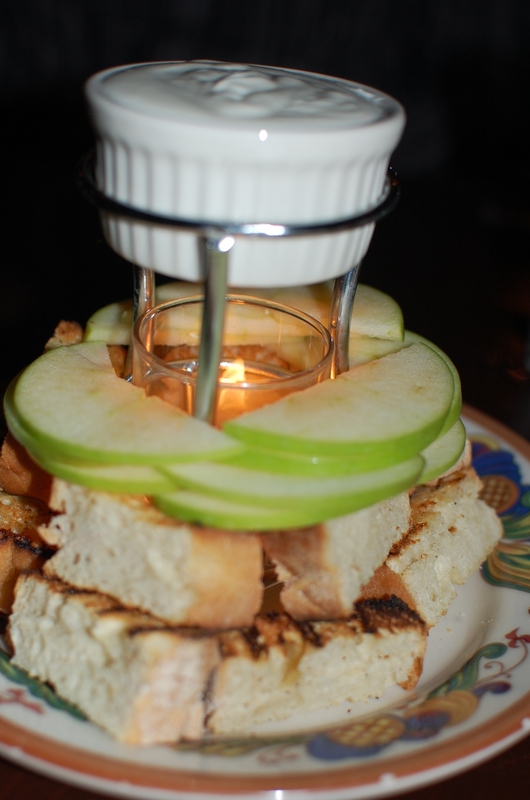 Then the warm goat cheese fondue arrived with a stack of grilled bread and apple slices on top. Dipping the bread and apple slices into the soft goat cheese with cream was great fun. Holly, our waitress, informed us that Luna Park is named after the Luna Park amusement park at Coney Island, New York. There are two Luna Park restaurants; one in Los Angeles and the other in San Francisco. Both have lively bars and moderately priced comfort food. All of the entrees are priced under $20. To my delight I noticed an Orviento, Ruffino white wine listed on their interesting wine list. Last summer, we drove by Orviento while traveling through Italy. The wine was crisp with a slightly fruity flavor that nicely accompanied my Mahi Mahi in an orange butter sauce. 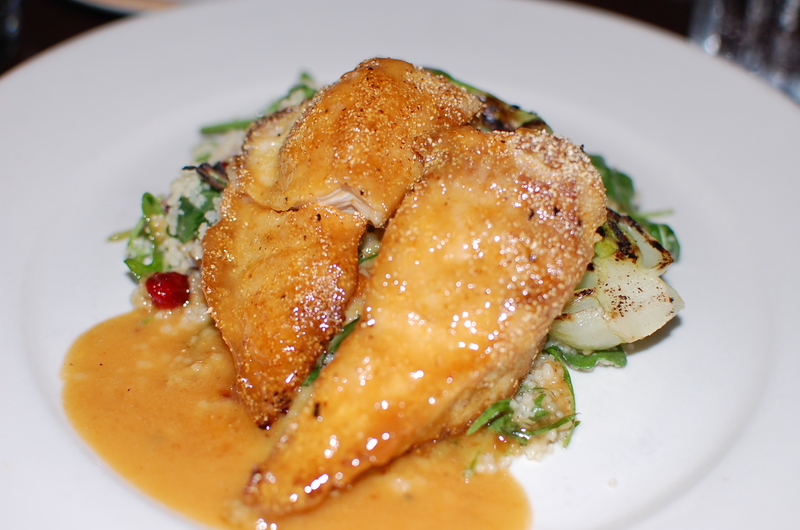 The tender fish rested on top a bed of grilled bok choy and cold cous cous with cranberries, spinach and hazelnuts. Dare I say this is the best cous cous in Los Angeles? My husband ordered a Burgundy colored Malbec from Argentina to pair with his grilled marinated chicken on a colorful heap of grilled brussels sprouts and butternut squash with a sage and brown butter sauce. Holly stated, “If they take the brussels sprouts and squash off the menu, there is rioting in the streets.” I believe it. It’s an exquisite side dish. The chicken was crispy on the outside and juicy in the center. For those who don’t eat brussels sprouts, I guarantee you will gladly devour these. While finishing our meal, we noticed the place was packed with groups of people. It’s not a quiet and romantic spot; instead it’s a great place to meet another couple or group of friends for tasty cocktails and innovative dishes. If you gather from 4 to 7 p.m. during the weekdays, you may mix and match drinks, appetizers, pizzas and petite salads at the 2 for 1 Happy Hour. We ordered the same desserts that the couple next to us were enjoying. The first was a nostalgic nighttime campfire treat “S’mores” with molten marshmallows in one fondue pot and bittersweet chocolate in another. It’s served with housemade graham crackers. The second was two deep friend apple pies drizzled with caramel and a bowl of caramel ice-cream. This dessert was too sweet to my liking and tasted similar to a fancier version of a McDonald’s apple pie. Open for brunch on the weekends, Luna Park offers bottomless sangrias and mimosas with fresh squeezed orange juice for $13.50. Each one goes nicely with bourbon and cinnamon French toast with berries and whipped cream or a fried egg sandwich with bacon, guacamole, tomato, cheddar cheese and arugula on sourdough toast. 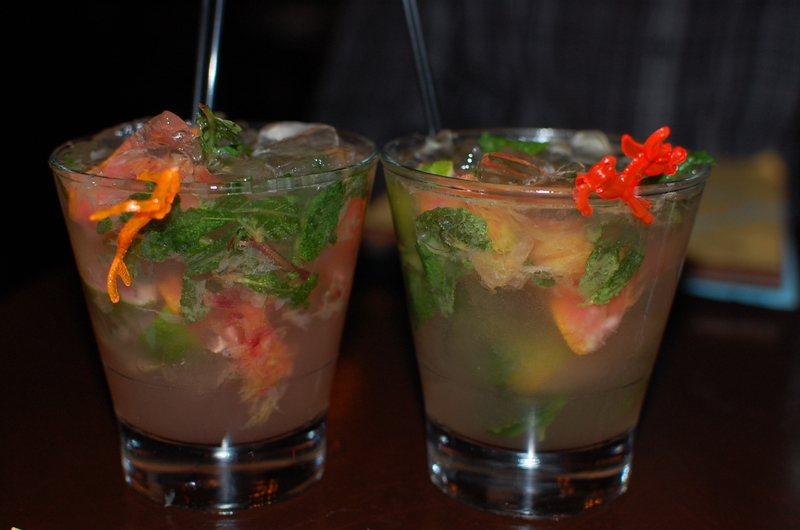 Luna Park is a great spot for creative food in a fun, yet casual atmosphere. Located on the corner of Park La Brea and Wilshire Blvd. They offer valet parking on La Brea. Their hours are 11:30 a.m. to 5 p.m. for lunch, 5 p.m. to 10:30 p.m. Mon. – Thurs. and Fri. and Sat until 11:30 p.m. Brunch is available from 10 a.m. to 3 pm. Price: $$. 672 S. La Brea, (323)934-2110.